Enables seamless connectivity between a USB-compatible PC and your device. Easy data transfer and synchronization. Sync while you're charging. iPhone, iPad, iPod. 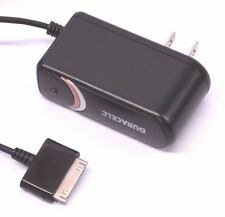 Original Duracell 30-Pin AC Adapter for iPad, iPod and iPhone. See photos for details and complete device compatibility. - Retractable cord. - For use with iPhone, iPod, and iPad (see photos for complete device compatibility). IPhone, iPad, iPod, Touch and Nano. 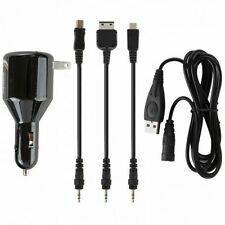 This product contains a 30 pin plug for the following Apple products The unit plugs directly into your vehicle's cigarette outlet port. 10 FT LONG. FAST CHARGING. IT HAS BEEN CUT OPEN AND HAS BEEN TAPED. CORD IS FINE. FABRIC CORD. HI PERFORMANCE. NEW/OPEN BOX. SIZE: 10 FT.
Duracell Powermat PowerSet II Kit. The PowerSet II is your complete wireless charging kit. PowerMat for 2 Devices. Wireless Charging Case for iPhone 5 & 5S. For use with iPhone, iPod and iPad. For Use With IPhone, IPod And IPad. We usually respond within 12 hours or sooner. Do not throw away anything! Check your porch; ask your neighbors and everyone who lives with you. If you didn't receive your item within 1 week (2-4 weeks international) . Works with Most Tablets & E-Readers. 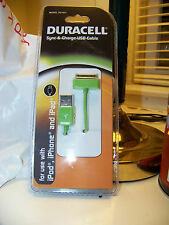 For Use With: Motorola, HTC, Blackberry, Droid, LG, Samsung, Sanyo, Kyocera, Nokia, Kindle, & Nook. Works for Most Tablets & E-Readers. Cell Phone Accessories. 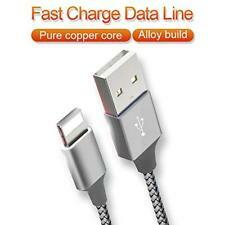 · NYLON BRAIDED CABLE is tangle-free and flexible for best portability. Less prone to wire breakage. · STURDY ALUMINUM CONNECTOR backs up files; downloads music and transmits photos with optimal speed. MODEL: DU5261. Model DU5261. For use with: iPhone, iPad, iPod touch, & iPod Nano. Brand new. Model LE2144. Any questions feel free to email me. Thank you! Cord color is black. 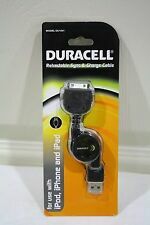 Duracell Sync & Charge USB Cable for iPod iPhone iPad DUX8214- New! Model: DUX8214. iPod touch 4th generation: 8GB, 32GB, 64GB. iPad: 16GB, 32GB, 64GB. iPod nano 6th generation: 8GB, 16GB. iPhone classic: 80GB. You are our number one priority and we will work diligently to take care of you. Brand new. Model LE2145. Any questions feel free to email me. Thank you! Cord color is white. Model FD4104. iPhone 3GS. iPod Touch (1st thru 4th Gen). iPad (3rd Gen). iPod Classic. iPod Nano (1st thru 6th Gen). For use with. 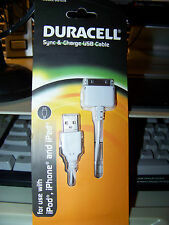 DURACELL Car Charger for iPhone iPad iPod - DU5261. Condition is New. Shipped with USPS First Class Package. Iphone 4s. - iphone 3GS. - iphone 3G. Sync while you're charging. For use with iPod, iPhone, iPad. Model DU1812. FOR USE WITH iPAD, iPHONE, iPOD, TOUCH, NANO DEVICES. Brand new. Model LE2213. Any questions feel free to email me. Thank you! Cord color is gold/bronze. TYPE - MODEL DU5204. We are committed to resolving any issue you may have.